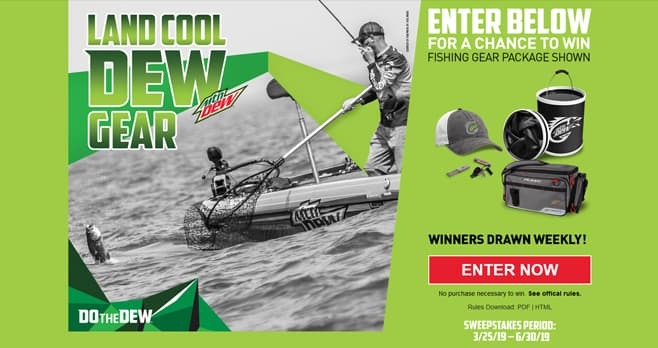 Mountain Dew DewFishing Sweepstakes: Mountain Dew is giving a few lucky fishing fans the chance to win a brand new fishing gear package. Winners drawn weekly! Text dewfishing to 72727 or enter online at dewfishing.com by June 30, 2019 for your chance to win. The Mountain Dew DewFishing Sweepstakes is open only to legal residents of the fifty (50) United States and the District of Columbia who are at least eighteen (18) years old at the time of entry. The Sweepstakes begins at 12:00:00 p.m. ET on March 25, 2019 and ends at 11:59:59 p.m. (ET) on June 30, 2019. One entry per person per day regardless of entry method. The grand prize consists of (1) Custom Dew Plano Brand Tackle Bag; (1) Custom Dew Collapsible Bucket; Custom Dew Fishing Cap; (1) Rapala Clipper Combo Fishing Tool Kit. Visit www.dewfishing.com to enter and see Official Rules for details.